What is glaring, though one may not have noticed, in AFL-CIO's President Richard Trumka's speech at the National Press Club, Washington DC on May 20 2011, is that there is no mention by him of President Barack Obama. (Text and video below). No mention and therefore no criticism of this Administration that the AFL-CIO endorsed, wasted tons of union wages dues and thousands of hours of members time promoting and campaigning for Democrats. The AFL-CIO's bureaucracy in the Democratic Party has to accept responsibility for having endorsed, helped fund and campaign for it. 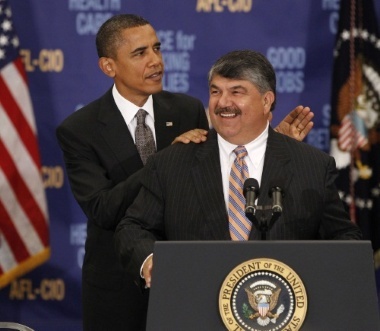 The absence of Obama's name in Trumka's speech is an indication that the AFL-CIO is leaving its options open - that it may not support the Democratic Party this coming Presidential election in 2012. Congress, and Republicans in particular were criticized for its 'canvas of cruelty', toward poor and working people. But, by omission AFL-CIO's president neglecting the mention of the Democratic Party is objectively to remove it from the same criticism of the Democratic Party. Yet, the Democratic Party's bipartisanship, in both the House of Representatives and Senate, has resulted in anti-worker policies. Perhaps, had Trumka mentioned Barack Obama, he would have had to announce that he accepted the Democratic President's appointment to the "Council on Jobs and Competitiveness" lead by GE CEO Jeff Immelt, chair of the Council. Immelt was recently criticized by Trumka as head of a company that did not pay taxes and a CEO that made billions. Trumka spoke of an independent labor movement. This could only mean political independence of the working class. Where is the "independent labor movement" spoken about in his recent speech? The distinction should be made that while Trumka talked about a 'movement', he did not call for and independent party, a labor party! A video of the Council on Jobs and Competitiveness's first meeting with President Obama is linked to below. The union leader was never called on to speak. Simply put, the AFL-CIO represents 12.2 million workers and the fact that it is numbered with corporate executives whose task is to set the "tone" for "outreach" to its 'constituency' concerning a Democratic presidents agenda is demonstrative of just how 'independent' the union bureaucracy plans to be. Not very! While the litany of offenses to the working class was correct, while contrasting the $4.3 trillion cuts in spending to the $4.2 billion in tax cuts for the wealthy is accurate, until the union denounces the Democratic Party as not serving worker's interests and ceases to campaign for it, workers should not follow the union to elect more Democrats. Referencing the Homestead Act (which was passed May 20, 1862- same day as Trumka's speech) and the American Dream does not outline a strategy for jobs. "Alex stood up for teachers and other public workers in Madison over the last couple of months, even as he built solidarity with workers in the Middle East. His family comes from Egypt and he strengthened links between movements for change around the world." Criticism of the Democratic Party, of capitalism, of the two party system and the building of a party that is independent of these is what Trumka left out of his speech. Why is labor endorsing candidates from Democratic and Republic parties rather than running candidates from a laborparty that has its own party line, designed by workers? Trumka: "All these incredible events should be understood as part of a single challenge. It is not just a political challenge—it's a moral challenge. Because these events signal a new and dangerous phase of a concerted effort to CHANGE THE VERY NATURE OF AMERICA—to turn this into an "I've got mine" nation and replace the LAND OF LIBERTY AND JUSTICE FOR ALL with the land of the rich, by the rich, for the rich." 'Liberty and justice for all' has been the rhetoric that children are compelled to recite in school during the 'Pledge of Allegiance". Even the author, Francis Bellamy, acknowledged that 'all' did not actually refer to all people living in the United States of America. It is in the interest of workers to do a critical review of all this school brain washing of children to believe the flowery words of the Pledge of Allegience, as though it was representative of social facts. It isn't. This school rhetoric posits a delusional ideology of American exceptionalism that is without empirical foundation. It is in the interests of the working classes in America to fight to 'change the very nature of America': that is the mode of production and appropriation's corresponding relations of production - from capitalist commodity production by wage labor to a society of workers. U.S. political economy has always been political representation "of the rich, by the rich, for the rich". This has always been the case. This can, must and will change, only by the American working class achieving true political independence of the capitalists, by forming their own class party that will fight for and win political power, a government of workers, by workers and for humanity. Not just for "Americans". To change the working class from an exploited working class to ruling class by winning the battle of democracy is the objective and philosophy. Let the workers' government transfer the means of production and distribution from the private possession of capitalists to the public property of the working classes. This would put an end to the buying and selling of labor power as a commodity. This change will enable the working class to do away with the capitalist mode of appropriation and thus end the capitalist dominated relations of production: universal abolition of commodity production will thus be replaced by production for consumption - where each contributes to the common good according to his or her learned ability, skills and talents and each receive from the common storehouse according to his and her need, they and their children and grandchildren. The implied economic analysis contained in Richard Trumka's speech therefore is inadequate from a working class political economic perspective. See snippets below. Real wages, in capitalist economics, means, how much a worker can actually buy with his/her wages. For example, suppose a workers wage stays constant while inflation raises the general price level by 10%. All other things remaining equal, the worker will be able to buy only 90% of what he/she was able to buy before inflation. The reverse would be true in the case of deflation. The worker would experience a 10% increase in what they could buy. "Real" wages are how much the wage actually is able to purchase while "nominal" wages (wage in name only) are the actual amount of money. Thus, nominal wages could be increasing while the actual amount of necessities these wages can buy is shrinking. Let us remind Richard Trumka that, for example, in the USA, real wages have fallen and leveled down since at least the mid 1970's. "A profitable US capitalism kept running ahead of labor supply. So it kept raising wages to attract waves of immigration and to retain employees across the 19th century until the 1970s." "Then everything changed. 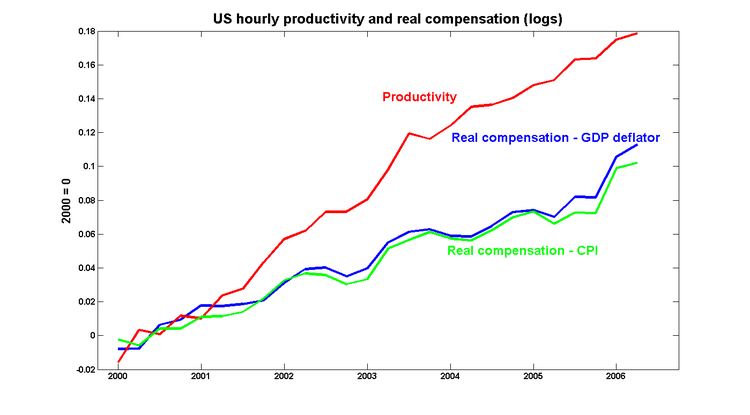 Real wages stopped rising as US capitalists redirected their investments to produce and employ abroad while replacing millions of workers in the US by computers. Women's liberation moved millions of adult US women to seek paid employment. US capitalism no longer faced a shortage of labor." "US employers took advantage of the changed situation: they stopped raising wages. When basic labor scarcity became labor excess, not only real wages but eventually benefits too stopped rising. Over the last 30 years, the vast majority of US workers have in fact gotten poorer when you sum up flat real wages, reduced benefits (pensions, medical insurance, etc. ), reduced public services, and raised tax burdens. In economic terms, American "exceptionalism" began to die in the 1970s." So while the GDP is increasing, real wages are falling. While GDP per capita is increasing, real wages are falling: the working class in the US has for at least the last 40 years been getting back an ever shrinking percentage of the ever increasing value that we produce. The gap between the value that social labor produces each year (GDP) and the proportion the producers of all wealth get back in aggregate wages and salaries is widening. And, this is the economic constitution of our entire modern society: the working class alone produces all values. For value is only another expression for labour, that expression, namely, by which is designated, in our capitalist society of today, the amount of socially necessary labour embodied in a particular commodity. But, these values produced by the workers do not belong to the workers. They belong to the owners of the raw materials, machines, tools, and money, which enable them to buy the labour-power of the working class. Hence, the working class gets back only a part of the entire mass of products produced by it. And, as we have just seen, the other portion, which the capitalist class retains, and which it has to share, at most, only with the landlord class, is increasing with every new discovery and invention, while the share which falls to the working class (per capita) rises but little and very slowly, or not at all, and under certain conditions it may even fall. Some and many workers might "feel" secure, "stable" in an economic sense, but actually they can never be economically secure as long as capitalist relations of social production and distribution exist. Capitalists are not altruists who invest to create 'jobs' ostensibly for the sake of workers having an 'income', the wherewithal to purchase means of subsistence commodities, as the Democrats suggest. The so-called 'stimulus package', legislated by Congressional Democrats and signed into law by Obama was not altruistic. Providing money to the surplus population of the cronic unemployed elements of the working class, and extension of unemployment compensation was not and is not for the benefit of 'the poor' and '49ners', as Democrats and their MSNBC, Nation Magazine, Solon.Com, Washington Post, Huffington Post - and even the AFL-CIO Blog - claim as motive, but because it is one way to service domestic industrial and agricultural capitalists whose crisis is relative overproduction of commodities, which otherwise could not be sold. This is what "cash for clunkers", together with the near trillion dollar gift by the government to auto industries was all about, Ed Shultz notwithstanding! The 'auto industry bail-out' wasn't to 'save jobs of American workers'. Rather, it was designed as compensation for auto industries declining rates of profits together with relative overproduction of automobiles that couldn't otherwise be sold! To return to profitability these bailed-out industries actually cut workers and reduced wages. Profits are derived from the exploitation of wageworkers, and this is why the Democrats are celebrating the 'success' of the auto bailouts and cars for clunkers in returning the otherwise bankrupt corporations to profit making. "DETROIT (AP) — For the first time in nearly seven years, Detroit's car companies are all making money. "Chrysler, the last of the three to return to profitability, said Monday it earned $116 million in the first quarter on revenue of $13.1 billion. The company, which emerged from bankruptcy protection a little less than two years ago, hadn't reported net income since 2006. "General Motors Co., which also went into bankruptcy in 2009 and took billions in government aid, has reported four profitable quarters and held an initial public offering in November to help repay its loans. Ford Motor Co., which didn't take bailout money but nearly filed for bankruptcy five years ago, recorded its eighth consecutive quarterly profit last week. Ford's 2010 profit of $6.6 billion was the highest in a decade. "It's the payoff for cutting staff, plants, car brands and wages during the recession and bankruptcy. The patriotic mumbo jumbo by Democrats and their ideological pundits and journalists about 'economic patriotism' and on this ideological basis denunciation of 'globalization' and 'American jobs shipped overseas', is the diversion of workers from critical analysis of the inherent barriers and contradictions that are located in the very nature of the system of capitalist commodity production by wage labor. When declining rates of profits occur alongside a shrinking domestic market, capitalists are compelled to export capital - invest elsewhere. For historical causes the prices of production in general and of labour power in particular (for example, in Mexico, China, India vis a vis US based production) is relatively cheaper. This enables capitalist transnational corporations, who relocate production, to produce their commodities more cheaply and thus to sell their commodities, relative to domestic production costs, at a lower price, domestically. The Democratic Party politicians, along with the labor bureaucracies that are part and parcel of it - including if not especially UAW President Bob King and AFL-CIO President Richard Trumka are representatives of the Democratic Party in the labor movement, rather than the masquerade as representatives of labor in the Democratic Party - deceitfully present the Obama Administration as representing worker interests. They are representitives of the interests of capital, delivering up to capitalist's corporations the gifts of lowering of wages of workers and customers to buy cheaper commodities. The motivation is profits. Thus, the increase in profits by the least cost combination, increased hourly labor productivity and decreased wages and with the displacement of human beings by machines. Capitalist relations of production are of course based on capitalist ownership of those means of production and distribution, the appropriation by capitalists of proletarian labour power and the exploitation of that labor in the production of commodities. Though the products are produced by the workers, these objects are produced as commodities in exchange for which the workers recieve wages, by means of which they must turn around and purchase from capitalists those very means of subsistence they themselves have produced as capitalist property. Inasmuch as the capitalist economy in the United States - based on commodity production, and appropriation by money of both labor power and its products - is competitive and therefore anarchistic, this economy goes through cyclical crisis from downturn to recession to bubble to crash to depression, etc. "As a matter of fact, since 1825, when the first general crisis broke out, the whole industrial and commercial world, production and exchange among all civilised peoples and their more or less barbaric hangers-on, are thrown out of joint about once every ten years. Commerce is at a standstill, the markets are glutted, products accumulate, as multitudinous as they are unsaleable, hard cash disappears, credit vanishes, factories are closed, the mass of the workers are in want of the means of subsistence, because they have produced too much of the means of subsistence; bankruptcy follows upon bankruptcy, execution upon execution. The stagnation lasts for years; productive forces and products are wasted and destroyed wholesale, until the accumulated mass of commodities finally filters off, more or less depreciated in value, until production and exchange gradually begin to move again. Little by little the pace quickens. It becomes a trot. The industrial trot breaks into a canter, the canter in turn grows into the headlong gallop of a perfect steeplechase of industry, commercial credit, and speculation, which finally, after break-neck leaps, ends where it began — in the ditch of a crisis. And so over and over again. We have now, since the year 1825, gone through this five times, and at the present moment (1877) we are going through it for the sixth time. And the character of these crises is so clearly defined that Fourier hit all of them off when he described the first as crise plethorique, a crisis from plethora." Economic security for the working class is an illusion under capitalist relations of production. Trumka, as a labor union leader, should know this. The working class need to be considering an alternative to capitalist commodity production and appropriation. In this way of organizing social production and distribution is not just exploitative of workers, but anarchistic by its very nature at its very core. In other words, to work out a political course for the working class requires the formation of an independent worker's party, seperate and apart from - in opposition to -the Democratic Party, as well as the Republican Party - a Labor Party that is financially based on unions as its sole source of funding, and socially in the working class as a whole. "... and what workers want is an independent labor movement that builds the power of working people—in the workplace and in political life." "Our role is not to build the power of a political party or a candidate. It is to improve the lives of working families and strengthen our country." The first and second statements are contradictory because by the very nature of interests resulting from capitalist ownership of the productive forces on one hand, and workers selling their labor power to and being exploited by capital accumulation in the labor process on the other, the political interests of personified capital and personified wage labor are mutually exclusive economically and politically. There can be no talk of an independent labor movement unless it is the call for the formation of a labor party in the struggle to expropriate State power by workers and for workers, as a class. George Washington was surely a millionaire. Both Adams, Jefferson, Madison, Monroe and Tyler owned large estates and had considerable wealth. Both Harrisons were from well-to-do families. Both Roosevelts, both Bushes and Kennedy were born into rich families. Hoover made a fortune as a mining engineer but started with nothing. The other presidents all had high paying jobs other than president and so became well-to-do if not exactly millionaires. With the possible exception of Andrew Johnson and those who died young, they all would have ended up as millionaires today. If not capitalist millionaires prior to becoming members of the House of Representatives or Senate, Democratic Party politicians, the same as the Republicans, go to Congress and become capitalist millionaires. A report from four scholars, Alan J Ziobrowski; James W Boyd, Ping Cheng; and Brigitte J. Ziobrowski, titled Abnormal Returns From the Common Stock Investments of Members of the U.S. House of Representatives, shows that between 1985 and 2001 members of Congress enjoyed a considerable advantage over members of the public in their investment returns. The following was published by Berkeley Electronic Press and is a follow up to a similar study done on investments by US Senators. John Ransom comments: "Actually 12 times .55 percent comes out to 6.6 percent annually. That .6 percent return accounts for an additional $130,000 over a 17 year period. So how lucrative can the 6.6 percent advantage be for Senators and Representatives? "A portfolio of $100,000 getting average stock market returns of 11 percent over a 17 year period would have grown to $589,000. If you were a member of the United States House of Representatives, though, enjoying the advantage that inside government information can bring you, your portfolio would have reached $1,573,000, according to an investment calculation I did using the finding from the study. "Assuming only average market returns for the next 20 years, a Representative would grow their portfolio to close to $13 million. 07/01/04 "AFP" -- WASHINGTON: The US Congress, the domed bastion of democracy in the capital of capitalism, abounds with deep-pocketed politicians whose fortunes have made the legislative branch of government a millionaire's club. In the 435-member House of Representatives, 123 elected officials earned at least one million dollars last year, according to recently released financial records made public each year. Next door in the ornate Senate, whose blue-blooded pedigree includes a Kennedy and a Rockefeller, one in three people are millionaires. By comparison, less than one per cent of Americans make seven-figure incomes. The American greenback is bipartisan, filling the pockets of liberal Democrats and conservative Republicans without discrimination. Liberal stalwart and Massachusetts Senator Ted Kennedy, brother of the late John Kennedy, disclosed that he has 45 million dollars in the bank. West Virginia Senator John Rockefeller, also a Democrat, reported to have earned 80 million dollars. The Senate is also home to Democratic presidential hopeful John Kerry, whose wife Teresa Heinz inherited 500 million dollars when her previous husband, senator John Heinz, of the ketchup empire, died in a plane crash in 1991. The Senate has always been home to the country's richest elements, and the rising cost of election campaigns has led both parties to encourage self-sufficient candidates to run for public office, boosting the number of wealthy elected officials, analysts say. "There tend to be more rich people in the Senate," said Richard Baker, the Senate's historian. "It has always been the case." Representatives and senators tend to hold lucrative jobs - attorneys, doctors and company executives. "Members of Congress are recruited not from (an) ordinary cross section of America occupations," said Thomas Mann, a Congress expert at the Brookings Institution, a Washington think tank. "There has been an increasing tendency for parties to seek out individuals who can self-finance at least part of their campaigns, and that has over time led to more wealthy people serving in Congress," Mann said. For instance, New Jersey's Jon Corzine, a former chief executive of Wall Street giant Goldman Sachs, spent more than 60 million dollars, a record, in his successful senate bid in 2000. The richest person in the House of Representatives is California Democrat Jane Harman, who reported assets worth more than 160 million dollars. Next in line is Amo Houghton, a New York Republican who reported 150 million dollars. In the Senate, Majority Leader Bill Frist, a Tennessee Republican and heart surgeon, unveiled a fortune worth 45 million dollars. His Senate foe, Minority Leader Tom Daschle of South Dakota, is among the "poorest" officials. Daschle disclosed earnings of less than one million dollars in addition to his 171,900-dollar a year Senate salary. Lower ranked senators are paid 154,700 dollars a year. In the House, Bill Thomas, the Republican chairman of the powerful Ways and Means Committee, which has oversight of taxation (or the pockets of average Americans), has one of the most modest financial disclosures. The California Republican reported no assets or investments, just his 157,000-dollar House salary and the value of his home. Souter may be the wealthiest member on the court. He reported that a single investment in the Chittenden Corporation, a Vermont bank, was worth between $5 and $25 million. The other multimillionaires on the court include Justice Ginsburg whose net worth is well north of $3 million and Justice Breyer, whose wife's family owns Pearson Publishing and the Financial Times of London. But not all the Justices are rolling in clover. What defines these members of Congress, Presidents, and members of the federal judiciary selected by Presidents and confirmed by the Senate, is not their official party affiliations as Democrats and Republicans, but that as such they are political personifications of capitalist class interests, which is the basis for and explanation of their 'bipartisanship' in legislation and so on. The common economic position of the common class interests of capitalists explain why in Congress the self-styled 'progressive' Democrats pretend to 'compromise' with the so-called 'conservative' viz. 'blue dog' Democrats. These 'conservative'/ 'blue dog' Democrats almost always vote with Republican 'moderates'. These 'moderate Republicans' in turn vote with Republican 'radicals'/ aka 'extremist' right faction of their party. The show of 'opposition' by their respective rhetoric notwithstanding, Democrats and Republicans represent the same general interests of the capitalist class as a class. The show of opposition is but the unessential masquerading as essential. The labor bureaucracy know this to be the case: their essential role is to promote this facade, whether it is by openly and directly endorsing Democrats, speaking at its national conventions or serving on 'presidential commissions on job creation', or indirectly by denouncing the Republicans as 'the party of the rich, while not making the same denunciation of the Democrats. Political analyst and host of The Last Word with Lawrence O'Donnell, Lawrence O'Donnell is also a capitalist as producer, and a millionaire who is talking head for General Electric's MSNBC. He claims to be a 'socialist', but lies when he says 'socialists are not opposed to profits' made by capitalists, which result from the exploitation of wage laborers in commodity production and valorisation by sale, and that socialism is: 'government running the military, schools and health care facilities', while leaving the means of production, distribution and communication the private possessions of capitalists. MSNBC's 'liberal' television and radio host and political pundit Ed Shultz is also a millionaire, notwithstanding his rhetoric about being 'fired up' in defense of the 'middle class' - which relates only to the purchasing power of means of subsistence by waged workers, and of 'Main Street' as opposed to 'Wall Street'. His advocacy for capitalist's 'economic patriotism' is in fact a warmed over version of 'national socialism' and fascism lite. This is in contradistinction to and opposition against proletarian internatinalism and communism, that demands proletarian possession of the productive forces, and, on this basis, worker's self management of production and distribution, from each according to his ability and to each according to his needs. The capitalist mode of appropriation is competitive, it's economic basis is best served politically by the democratic republic. The working class in the US cannot win the battle of democracy without our own political party and candidates with absolutely no ties whatsoever to the Democratic party. By what is the price of a commodity determined? By the competition between buyers and sellers, by the relation of the demand to the supply, of the call to the offer. The competition by which the price of a commodity is determined is threefold. The same commodity is offered for sale by various sellers. Whoever sells commodities of the same quality most cheaply, is sure to drive the other sellers from the field and to secure the greatest market for himself. The sellers therefore fight among themselves for the sales, for the market. Each one of them wishes to sell, and to sell as much as possible, and if possible to sell alone, to the exclusion of all other sellers. Each one sells cheaper than the other. Thus there takes place a competition among the sellers which forces down the price of the commodities offered by them. But there is also a competition among the buyers; this upon its side causes the price of the proffered commodities to rise. Finally, there is competition between the buyers and the sellers: these wish to purchase as cheaply as possible, those to sell as dearly as possible. The result of this competition between buyers and sellers will depend upon the relations between the two above-mentioned camps of competitors – i.e., upon whether the competition in the army of sellers is stronger. Industry leads two great armies into the field against each other, and each of these again is engaged in a battle among its own troops in its own ranks. The army among whose troops there is less fighting, carries off the victory over the opposing host. Labor power is sold and bought as a commodity. It is sold to capitalists by the hour, and bought by capitalists for an hours work. The working class has by its trade unions been able to force the capitalist to acknowledge the legal limit of the working day to eight hours, five days per week. Yet, the capitalists have been able to compensate for this by displacing the quantity of workers needed by displacing human work by machines, the intensification of labour productivity, while keeping the spending power of the workers to average the cost of living. When there is a crisis of overproduction, workers are laid off because the commodities they have produced in the labor process cannot be sold, or 'jobs' are exported to regions where labor power is cheaper, and the working day/ week is longer. There is no way the Democratic Party's capitalists and millionaires/billionaires in the U.S. Senate, or the Judiciary, will advocate for, nor even pass legislation from the lower house [House of Representatives] that will cut into the profits of industrial or agricultural capital, nor even the parasitic appropriations of tax monies by finance capital - interests on money rented to the government to finance the State - let alone to legislate, sign into law or constitutionally approve working class legislation that cut into profits for the benefit of wage workers. The American working class needs its own class party that can win the battle of democracy by electing a majority of members into the House of Representatives. It will become necessary to force the Senate, the President Administration and the Judiciary to submit to the Labor Party majority of the House of Representatives, or abolish those capitalist dominated 'branches of government' to make the House of Representatives the House of Labor the sole government. Because the American Labor Party will be financially based on the trade unions, and socially on the participation of workers and oppressed minority communities, it will not accept any money whatsoever from capitalists or banks to finance the campaigns of members running for office, and therefore will not be subjected to the interests of capitalist lobby donations. To accomplish this financially, and therefore politically independent Labor Party's winning the battle of Democracy, all candidates will be subjected to and representative of Labor's 'special interest' - openly and boldly, and not subjected to 'compromise with "Blue Dog Democrats" and "Moderate Republicans". Nor, for that matter to 'Progressive Democrats", which include the current crop of labor bureaucrats. The Labor Party can be formed of the trade unions only when its rank and file members boot out the Democrats that now hold administrative office and the power thereof. To win the battle of democracy, it must be fought for in every union local and regional branch, and at state and regional conventions, up to and including the federal federations of unions! Every class struggle is a political struggle - a struggle by united class political power, the unions, and therefore the labor movement itself, as a whole, has to overthrow the current bureaucrats who are part and parcel of the Democratic Party - as well as the Republican Party - by campaigning for local, county, state, regional and national offices on a political program to break from the Democrats: for the formation of a labor party that is financially based on these unions and in the class itself! We have nothing to lose but our chains. We have the future to win: the formation of a politically independent working class party is only the beginning. The immediate objective of this labor party is to displace in the House of Representatives all Democrats and Republicans, to make the House of Representatives the House of Labor. All these incredible events should be understood as part of a single challenge. It is not just a political challenge—it's a moral challenge. Because these events signal a new and dangerous phase of a concerted effort to CHANGE THE VERY NATURE OF AMERICA—to turn this into an "I've got mine" nation and replace the LAND OF LIBERTY AND JUSTICE FOR ALL with the land of the rich, by the rich, for the rich. You see, I believe the United States is not a place as much as it is an idea. For working people, the United States of America has offered, from its foundation, a promise that everyone can be full participants in national life. A promise that we the people make the rules so that hard work is rewarded with economic security and a fair share in the wealth WE ALL HELP CREATE. That promise has always been a work in progress. From the beginning of this country, through our efforts and our ideas, working people have made the American Dream real. And what is that dream? It is the idea that if you work hard and play by the rules you will enjoy ECONOMIC SECURITY and build a better future for your children. It is not that a few of us will be rich, but that all of us will be treated fairly, that we will look after each other, and that we will all have a share in the wealth we create together. ...America's ECONOMIC FATE depends on us coming together to educate our children, to invest in our infrastructure, to face the threat of climate change and to reverse the yawning economic inequality that threatens our future. The ultimate goal of those who blame workers for Wall Street's economic crisis is to unravel the fabric of our COMMON LIFE in pursuit of greed and power. We will uphold the dignity of work and restore respect for working people. In this season's political battles, teachers, nurses and firefighters have been vilified. Decent jobs with ECONOMIC SECURITY have been cast as more than America's workers deserve. Low-wage, part-time, temporary, no-benefit work is being sold as the "new normal" for our economy.